Adventurous eater? Hot date to impress? Want to tick something off your bucketlist? Reserve a table at your local sushi hotspot, read our guide and tuck into this classic Japanese cuisine without looking like a total noodle. N.B. Here we’ll be talking about ordering and munching through delicious piles of sushi at a conventional “sit down restaurant”. There are lots of sushi places out there where conveyor belts deliver your dishes or where your fishy fare is prepared by a sushi chef at your table – if you’re heading out to this kind of restaurant, the dishes, rules and etiquette are pretty much the same, just remember – don’t panic! If you’re interested, the conveyor belt style of dining is known in Japan as “Kaiten-zushi” and, if you’re feeling especially outrageous you can even enjoy “Nyotaimori” (sushi served on a naked body). Step 1 - What on earth do I order? This is the classic sashimi fish. A good slice of maguro sashimi should be a beautiful glistening deep dark pink colour. Eaten raw, this is a meaty fish with a smooth, melt in the mouth texture which tastes nothing like that flaky grey stuff you get in a tin and mix with mayo for your sarnies. It is rich and (of course) fishy, but not as salty as many other sea-dwelling fish. If you like smoked salmon, you’re probably going to fall in love with sake sashimi. Unsmoked, raw salmon is slippery, buttery and sweet with a deep, creamy taste. Look out for it’s bright orange glow on your sashimi platter, it’s an indisputable highlight. There are many different types of prawn which might pop up in a sashimi selection but the amaebi (or sweet prawn) are the most common by far. These pretty, pink little shellfish are cool, sweet and very yummy indeed. Unlike it’s freshwater cousin (unagi), saltwater eel are eaten raw as sashimi. These slippery characters are sliced very thinly to avoid their small bones, then dunked in ice water to get rid of any earthy tangs they might have picked up living under the sand of the sea floor. With a pale white to pale pink colour, this is a very delicate sashimi, characterised by its slippery texture. There are all sorts of these scuttling delicacies which you may find on your sashimi platter. Kani (soft shell crab) is the most likely, but you might also come across kegani (hairy crab), matsubagani (snow or champagne crab) and tarabagani (king crab) – amongst others. Each variety has subtle differences, some are very meaty, others particularly sweet. In general though, crab meat is delicate and sweetly, meatily flavoursome. Unless your saba has been caught mere hours ago, chances are you’re going to be served up a cured version which has been salted for 3-4 hours and then washed with rice vinegar. This is because the pale pink and white mackerel, usually served with a flash of its silver skin, is one of the quickest fish to spoil. Expect a fresh, salty flavour and a strong, dry after taste. If you’re served up hamachi when you order yellowtail, don’t worry, hamachi is simply the young version of the adult buri. You’ll recognise yellowtail thanks to its delicate rose pink colour and you’ll order it again once you’ve tasted its firm, flavourful flesh which has a pleasantly oily texture. This oil has a surprisingly fresh, sweet aftertaste which contrasts deliciously with the rich meat of the yellowtail. Yes please! Now you know a little more about which fish to munch, it’s time to take a closer look at the types of sushi that can accompany your new favourite sashimi. 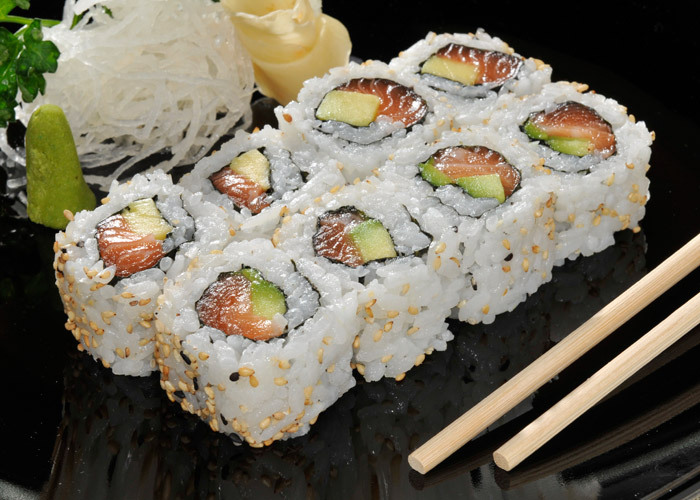 In really basic terms (which would make connoisseurs furious), raw fish (sashimi) becomes “sushi” when it is added to rice accompaniments. However sushi doesn’t have to include any seafood whatsoever. These bite-sized rice morsels can include vegetables, egg omelettes and a range of other tasty bits and pieces, all on their own, or wrapped up all together like a confusing but delicious Christmas. 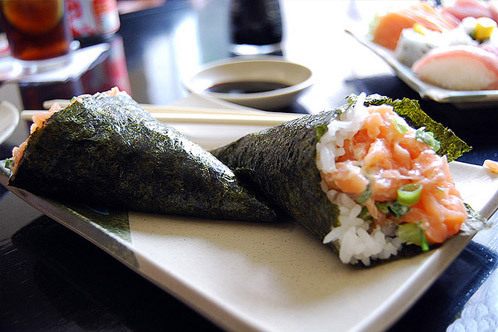 Most varieties of sushi will come wrapped up in a purpley-green “coat” called nori. This is made from layers of dried, flattened seaweed and used to hold your sushi together in nice, neat little parcels, ready to be wolfed down. So what different types of sushi can you choose from? 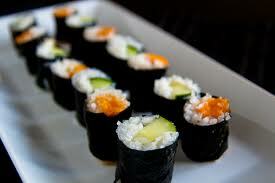 Nigiri - Unlike maki, nigiri are rectangular “blocks” of rice with the ingredients placed on top. 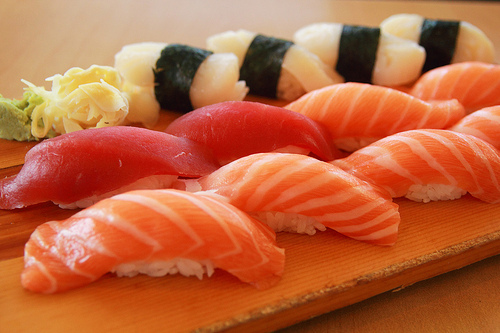 The correct way to eat nigiri is to turn them upside down so that the fish touches your tongue first. 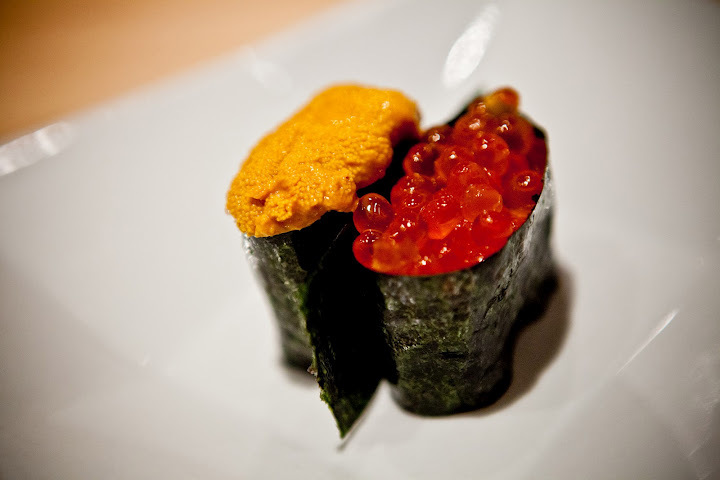 Gunkan Nigiri - A type of nigiri, topped with sea urchin or fish roe (tobiko, ikura or uni) with a nori wrapper which carries the ingredients a little like a sushi “boat”. You’ve navigated the menu, found your favourites and ordered the perfect quantity, but for many people the most intimidating part of the sushi eating experience is yet to begin…handling chopsticks without throwing raw fish onto your own face, your date’s face or your exasperated waitress’s face. If you’re ordering sushi but not sashimi – rest easy. It’s perfectly acceptable to stuff those tasty little rice parcels into your chops with your fingers. 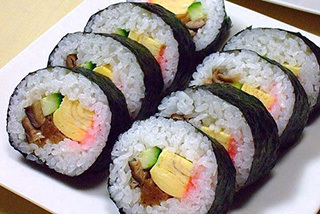 In fact, because sushi started off as Japanese street food, it’s actually traditional to eat nigiri and maki with your hands. Go right ahead! Do not in any circumstances pass food using chopsticks In Japan, when a deceased family member is cremated, Buddhist funeral rituals involve passing their bones from chopstick to chopstick. Not something anyone wants to think about over a delicious dinner. Avoid at all costs. Don't mix your wasabi into your soy Instead, if you want a dose of the hot stuff, dab it onto your sushi or sashimi before you dip your morsel into your soy sauce. Also, avoid coating your food in the stuff, the heady “mega-mustard” rush may be fun, but it's a huge insult to your sushi chef to obliterate their creation with tonnes of wasabi. Only use ginger as a palette cleanser Here's another insult to the skill of your sushi chef. Ginger will drown out all of the deliciousness of your dish and is only to be used between courses and at the end of a meal as a palette cleanser. Don't go soy crazy Equally, don't coat every piece of sushi with soy. Only the fish part of your food should touch the sauce when you dip and your little dish should never be filled to the brim. Instead pop a little in and top up as you go. Or else. Remember: Down in one The very best sushi is designed to be bite-sized so you should be able to eat each piece in one bite. Breaking it up with chopsticks or taking a bite is not only messy, it's also a criticism of your sushi chef's skills. Do not hold a bowl and your chopsticks in one hand Never pick up crockery; not a glass, not a bowl, not a plate - while holding your chopsticks in one hand. We're not sure why you'd be doing this or what sushi sin you'd be committing but it is considered decidedly Not. Cool.